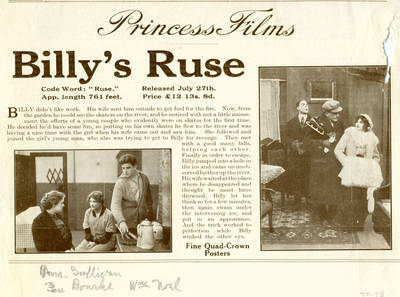 Half page advertisement for British release of the Thanhouser Princess Film "Billy's Ruse." Featured Boyd Marshall, Muriel Ostriche, Catherine Webb, Eugene Redding, Charles Emerson, Mrs. Sullivan, Fan Bourke and William Noel. Released March 13, 1914 in the United States and July 27, 1914 in England.